To some collectors, clothing is the ultimate memorabilia, the feeling of owning garments actually worn by their heroes. They’re willing to pay hefty prices for rare items, too, although many of those buying are institutions of chains like Hard Rock Café, since they have the resources to afford the prices often demanded at auctions. The ultimate icon for clothing is John Lennon, although his 1960s clothing is the most desirable. But that doesn’t mean the 1970s are ignored, although post-Beatles clothing items are much harder to obtain. As a sign of his collectability, at a 2006 auction, a pair of jeans he’d worn in the 1970s went for £5,500. Given that Lennon clothing is out of reach for most collectors, what can you realistically buy in the way of clothing from 1970s stars? Perhaps surprisingly, Elton John’s clothing is among the most affordable – around £100 for a shirt or a designer suit for less than £250 (a bargain under any circumstances). However, that’s largely because once a year he sells off a lot of his clothing for charity, opening a shop called Elton’s Closet, where you can find his garments at knockdown prices. 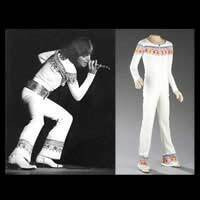 One 70s pop star whose clothing has fetched quite astonishing prices is David Cassidy, whose star has risen again of late. In a 2006 auction, worn jumpsuits were going for up to £2,000, with a shirt fetching over £1,000, and a stage jacket the lowest priced item at a hair over £200. In this instance the auction was prompted by Cassidy himself, who was selling off a number of items of memorabilia. That solved any issues of provenance, and also brought 22 items of his clothing onto the market – a large amount by any standards. The simple fact is that you’re not going to find a lot of 70s celebrity clothing. For many musicians there was no distinction between regular and stage clothing (the era of the stage suit had largely passed), and when the items wore out, they were simply discarded, as no one gave a thought to them having any future value. If you find items on eBay, insist on a strong provenance before you venture a bid. After all, anyone can claim an old shirt or pair of jeans was owned by a rock star. If you’re going after items from a specific artist, find out all you can about him – what sizes he wore, for instance, and check against what’s being sold. It could save you a lot of money on scams. Mostly, the garments that appear are through auctions, rather than dealers (although dealers will handle the smaller stars), since the real interest is in clothing of the big stars. But unless it’s a John Lennon item, don’t worry too much – the chances are you might be able to buy it for less than you’d imagined. This is a tricky area. You certainly won’t lose if you purchased those Lennon jeans, for instance, but beyond that, it’s a bit of a minefield. At the moment there’s not a lot of value to most clothing from this decade, but that could easily change. However, if you’re looking for investments, unless you’re really willing to play a long game, you’d be better with other items.